Faron Kelley is the Vice President of ESPN Wide World of Sports, runDisney and Disney’s Water Parks at the Walt Disney World® Resort. The ESPN Wide World of Sports opened in 1997 as a new venture targeting the burgeoning Youth Sports travel market. The 250-acre sports complex currently provides fabulous facilities to over 400K athletes a year. runDisney launched its first WDW marathon in 1994 and has grown into one of the largest running organizations in the US. WDW Water parks are the two most visited water parks in the US. These three distinct businesses are home to approximately 2,300 hourly and salaried Cast Members. Kelley joined the Walt Disney Company in 1990 as a production manager and producer for Walt Disney Entertainment and from there he joined the launch team for the Town of Celebration serving as the driving force behind many of Celebration’s early special events and marketing concepts. After returning to WDW Resort, he led a series of ad-hoc teams through development and execution of multiple property-wide celebrations, including New Year’s Eve 1999, Magical Gatherings and the Happiest Celebration on Earth. 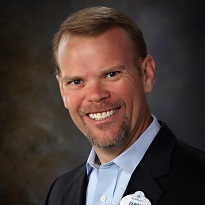 His marketing career continued with Adventures by Disney before returning to the Parks division as the Global Project Development Director for Disney Parks, leading multi-site and property wide celebrations. Kelley joined the Sports organization in 2008 as the Marketing Director and was responsible for all aspects of Marketing including the rebranding of the sports complex to incorporate ESPN and the launch and global growth of the runDisney brand. In 2016, Kelley was promoted to the VP role that he currently holds. He is a graduate of Iowa State University where he received his bachelor’s degree in marketing and he also holds an MBA from Indiana University.